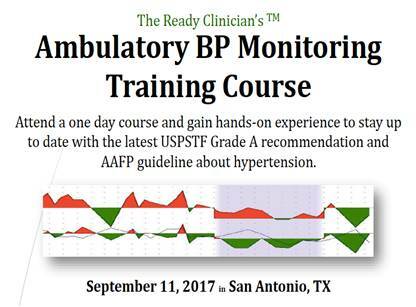 24 hour Ambulatory Blood Pressure Monitoring (ABPM) is the gold-standard for diagnosing sustained, white coat, and masked hypertension. It’s a better predictor of cardiovascular events than office readings and carries a Grade A recommendation by the United States Preventative Services Task Force (USPSTF). The evidence is unequivocal and yet not all nephrologists perform ABPMs. Fellows have even less exposure to implementation, interpretation, and reimbursement. Last year, Raymond Townsend of U Penn and Daichi Shimbo of Columbia-Presbyterian created a course to address the above deficiencies. 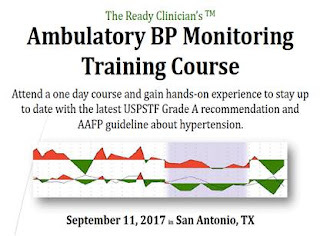 In addition to reviewing the evidence and billing aspects, the course focuses on practical considerations such as learning about the software and monitoring protocols, and correctly educating the patient on the dos/don’ts while wearing the monitor. The hands-on session allows attendees to familiarize themselves with the various models and wear an ABPM for the afternoon. After attending last year, I not only gained a deeper understanding of ABPM but now have a resource for future questions. This year’s course (1 day) will be held on Monday, September 11th, in San Antonio, TX. I have no financial or formal relationship with the organizers. Glomerular Disease Case Conferences from GlomCon on Vimeo. I would like to introduce you to a new educational project for Nephrology fellowship programs, the Glomcon Teaching Tool. It has been selected as a finalist in this year's ongoing ASN Innovation contest. 1) A Pre-conference 'Glomcon Trivia' webinar : Tuesday 12pm. -Conferences include pathology slides review by a nephropathologist. Discussion is led by a volunteering nephrologist. We will organize the first Glomcon Trivia session on August 1 with the case conference on August 2. At this time, 13 programs across the country are participating in it. If you or your program would like to be a part of this endeavor, please email me at nagrawa2@bidmc.harvard.edu. If you would like to sign up for the Glomcon case conferences, please email conferences@glomcon.org. Treatment of HCV with the new DAAs: Before or After Kidney Transplant? In the pre-DAA era, the dogma was to treat HCV pre-transplant for two reasons: active HCV increases post-transplant hepatic complications, NODAT, and decreases patient and graft survival and that IFN cannot be used post-transplant because of higher risk of graft rejection. The highly effective and safe newer DAA options have literally eliminated both of these problems making the hitherto unfeasible strategy of treating HCV post-transplant feasible. Needless to say, pre-transplant treatment can improve the risk of HCV-related morbidity, incidence of diabetes and possibly cardiovascular disease in waitlist candidates but they do have to wait longer (3-5 years) for an HCV negative kidney post treatment. Instead, if they choose to receive a HCV+ kidney and get treatment post-transplant they just have to wait only for 6 months to 1 year. The downsides of waiting longer (after successful HCV treatment) are worsening of their general condition during the wait time and even never getting transplanted at all. Receiving an HCV+ kidney and treating HCV post-transplant is safe, shortens waiting time and is cost effective. Purely on a utilitarian basis, it does make sense to treat HCV post-transplant, unless the wait time is expected to be short i.e. AB blood group, live donor transplant, centers with short waiting time or if liver disease is severe enough to warrant early treatment. For live donor transplants planned within 24 weeks, HCV treatment should not unnecessarily delay the transplant itself as the cure can be obtained with DAAs post- transplant. If the transplant is expected to be delayed (>24 weeks), it is wise to treat GT1/4 pre transplant with renal safe non-sofosbuvir regimens but for non GT1/4, depending on the expected time of transplant, sensitization and risk of rejection, liver status, general condition and patient preference, the treatment can be performed either pre-transplant with IFN/ribavirin or post- transplant with sofosbuvir based DAA regimen. Growing RAV (resistance associated variants) and DAA resistance is a threat to HCV treatment. Further DAA treatment for non GT1/4 in renal failure and allograft dysfunction is still a challenge. Pan-genotypic DAAs which are effective and safe in renal failure will hopefully soon be a reality. Glecaprevir/Pibrentasvir is one such DAA now awaiting FDA approval. It has been found to result high SVR irrespective of genotypes, liver status, previous IFN exposure and CKD stage (98% SVR in stage 4/5). The effectiveness in DAA exposed patients is being currently studied by MEGALLAN part 2 study. The estimated global Hepatitis C viral infection (HCV) burden was slashed down to 71 million by the WHO in 2015, from the earlier estimate of 130-150 million, after Rao et all showed that only 51% of patients with positive serology actually carried the virus (detectable RNA by NAT, nucleic acid amplification test). The remaining HCV seropositive have either cleared the virus [spontaneously or after treatment] or have a false positive serology. These NAT negative seropositive patients are considered non-infectious. NAT positive but seronegative individual are always infectious, except for the rare patients with false positive NAT (< 0.2%). NAT is the only reliable way to diagnose HCV in transplant candidates since these patients can be seronegative (due to immunosuppressive state) despite viremia and can have normal liver enzymes despite having liver disease. Overall, genotypes GT1 followed by GT3 are the most common strains and have a global prevalence compared to GT 2,4 and 6. GT5 is the least common of all having prevalence of <1% and limited to southern Africa. In the United States, approximately 70% of chronic HCV infections are caused by GT1 (55% of 1a, 45% of 1b) followed by GT2 (15 to 20%) and GT3 (10 to 12%). GT 1 is the more aggressive of all and also more resistant to interferon therapy but GT2 has greater risk of CKD progression than GT1. Transmission of a virus in eclipse phase (see below) is a well-known phenomenon with HIV and HBV. The eclipse phase is the time lag for the NAT to detect viremia after an acute infection. Even with the new generation HCV PCR tests, there is an eclipse phase of about 5-7 days. The first ever report of transmission of HCV from a NAT negative donor was reported in 2015. Notably in all the reported cases, the deceased donors had high risk behavior. The HCV infection being missed in a potential transplant recipient or a live donor in the eclipse phase has not been reported yet but is theoretically possible, especially in centers/countries with high HCV prevalence. The introduction of DAAs was met with excitement by nephrologists, see previous RFN coverage. The treatment of GT1/4 in CKD is quite straight forward as non-Sofosbuvir regimens are available i.e. Elbasvir/Grazoprevir (EG) and PrOD (Paritaprevir, ritonovir, Ombitasvir, Dasabuvir +R(ribavirin in GT1a). See here for coverage of the C-SURFER on the blog. These combinations can be used even in CKD4/5D as they are metabolized by the liver. In contrast Sofosbuvir has renal excretion, accumulates in renal failure (eGFR < 30ml/min/1.73m2) and unfortunately further worsens the renal failure and hence contraindicated in CKD 4/5D. Since a Sofosbuvir-based DAA regimen (Sofosbuvir plus Velpasvir or Ledipasvir or Daclastasvir or Simeprevir) is the only approved treatment for non GT1/4 ,patients with eGFR< 30ml/min/1.73m2 should be treated with pegIFN/ribavirin and those with less severe CKD can be still treated with Sofosbuvir without any dose reduction. This might change after the results of the study looking at effectiveness of low dose Sofosbuvir/Velpatasvir in non GT1/4 HCV patients with CKD5D, are available. Paritaprevir (effect of which is enhanced by ritonavir) inhibits the CYP3A4 enzyme causing 4-6 fold elevation in cyclosporine levels and nearly 60-80 fold elevation in tacrolimus levels, making use of the PrOD regimen less desirable in transplant setting. Even though PrOD was effective in liver transplant studies and no rejection reported with CNI dose changes, it has been never used in renal transplant studies. Since there is little direct data in allograft dysfunction, the data from CKD may be extrapolated to the transplant setting. Outcomes of HCV D+/R+ was considered inferior to D-/R+ since the early viral replication with immunosuppression was thought to increase the risk of the liver disease, graft failure and patient mortality. It was even considered that transplantation outcomes with HCV+ donors not different from HCV+ patients remaining on dialysis. In reality, the risk was later found to be very small from 13 year UNOS data published in 2012. The risk of receiving a HCV+ kidney translated to only <1% lower survival at 1 year and a 2% lower survival at 3 years. Also, recently Morales showed that 10 year patient and survival graft survival was not different between D+ and D- to R+ patients. Increasing IV drug abuse in the past two decades has increased the prevalence of HCV in the young. Many of these newly infected population are unaware of the infection and so unlikely to get treatment but more likely to die due to drug over-dosage and hence are potential donors of high quality kidneys. About 300-500 unrealized opportunities exist each year in US and nearly 4100 HCV positive good quality kidneys (with average KDPI 70%) were discarded between 2005- 2014. In the following post I will deal with treatment issues including whether to treat with DAAs pre or post transplant. The July 2017 nephrology webisode is part 2 of a series featuring vascular access expert Dr. Dirk Hentschel. In last month's episode we went to the bedside to examine the access of 2 patients on chronic hemodialysis. This episode is a more traditional lecture that reinforces several concepts about pressure, flow, and how to approach some common vascular access problems that are often encountered.